I am extremely late to the party on this H&M collection which actually launched online and in stores worldwide on 20th April 2017. The collection from H&M is their Conscious Exclusive which is a premium line that has been created specifically using only sustainable materials. I have seen the items in store and they are all absolutely stunning, beautifully made, they have hit all the current trends so you can expect a lot of floaty pieces, yellow because that is the colour of the season and anything flared from trousers to sleeves on blouses...did I just make up a rhyme then? !...sad I know. The only niggly thing I would have to say about this collection is the sizing, well lack of especially here in Kuala Lumpur where for some strange reason they only seem to carry up to size 40 apart from that I can't fault it any further and I am totally looking forward to seeing more from this collection. 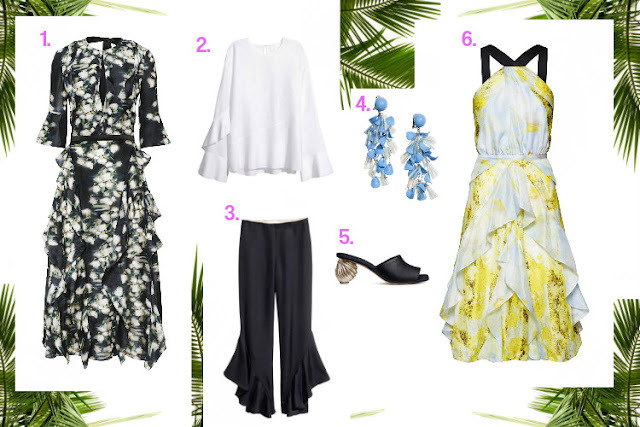 It was so so hard to pick my Top 6 because I loved them all, I ended up going with the items that I could see myself wearing and would easily fuse with what I already have in my wardrobe. I did try to find links for all the items above but found most had already sold out online. My picks featured in this post are still in stock in the Lot10 Kuala Lumpur store apart from the earrings, therefore, I am almost sure you will still find stock in your local H&M store. Do let me know what your favourite pick is from this post? and have you already bought something from this collection? Would love to know what is was and what you think of this collection. I really love everything in your post! I would love to get every piece but I will have no money. haha I love you post my dear. Keep it up!